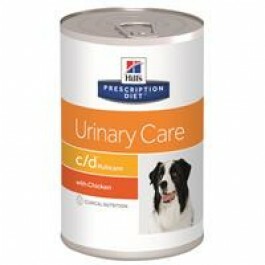 Hill's Prescription Diet c/d Canine is a complete and balanced food that provides all the nutrition your dog needs. It helps to dissolve struvite stones and reduces the risk of struvite and calcium oxalate stones or crystals developing again. It is recommended for long-term nutritional management of dogs prone to struvite, calcium oxalate and calcium phosphate crystals and uroliths. Reduced magnesium, phosphorus and protein - decreases urinary concentration of struvite constituents, magnesium and phosphate. Added superior antioxidant formula - neutralises free radicals to help combat urolithiasis. Added omega-3 fatty acids -&nbsp;helps break the cycle of inflammation. Added&nbsp;Vitamin E &amp; beta-carotene - helps neutralise free radicals to help combat urolithiasis. Vitamin C not added - it is a precursor of oxalate. Beef, chicken, ground rice, ground maize, pork liver, vegetable fibre, vegetable oil, calcium sulphate, potassium chloride, iodised salt, vitamins and trace elements. 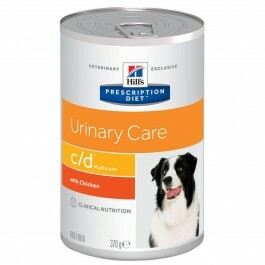 Hill's Precription Diet c/d Canine should be recommended by your veterinary surgeon. For detailed information on feeding amounts and how this food can help your pet, please consult your veterinary surgeon. For the best results ensure a graduall transition to your dog's new food over a 7 day period. Exclusively feed the recommended Prescription Diet food and keep fresh water availalbe at all times. Please note that this is a guide only and that individual animals may have different requirements. Adjust the feeding amount to maintain the optimal body weight. Royal Canin Urinary S/O is a complete dietetic feed for dogs formulated to dissolve struvite stones and reduce their recurrence through its urine acidifying properties, a low level of magnesium and a restricted level of protein, but of high quality.